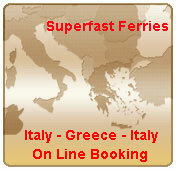 Venice (Italy) - Igoumenitsa (Greece) - Patras (Greece) & v.v. Certain accommodation types may not available on vessels operating the route. ** Motorcycles with a side car or a trailer or 4 wheels are charged as vehicles up to 6m long & 2m high. (1) Six bed dormitories are located in a unified area, divided into male and female sections, each with communal showers and restrooms. Passengers who require bed linen may request it at the reception. Dormitories are available on Superfast XII and Superfast XI. Pet cabins are 4 bed inside & outside cabins, that can be booked as 4 bed, 3 bed, 2 bed. Pet cabins are not available on a per bed basis. Single occupancy has a supplement of 70% on the respective double occupancy. PURE cabins are LUX, A4 or AB4 cabins and they are available on Superfast VI & Superfast XI. Occupancy of these cabins is not available on a per bed basis. Single occupancy of an inside or outside PURE cabin (AB4 or AA4) has a supplement of 100% on the respective double occupancy. Single occupancy of a LUX PURE cabin has a supplement of 70% on the respective double occupancy. For the 06:30 departure from Igoumenitsa and the 07:45 departure from Corfu, the seasonality of the previous day applies (departure from Patras).